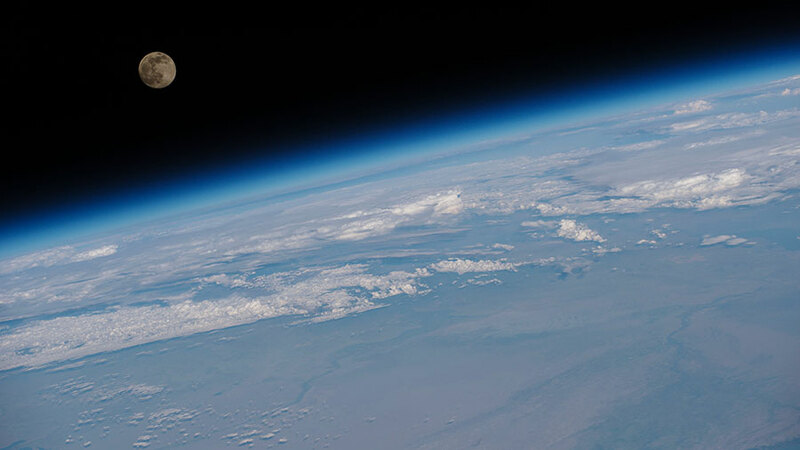 The moon is pictured above Earth from the space station. A cargo ship that was released last week from the International Space Station will re-enter Earth’s atmosphere Wednesday. Back inside the orbital lab, the crew practiced emergency procedures after a light day of science and maintenance. The Orbital ATK Cygnus space freighter is spending its last day in space today. Cygnus has been busy conducting an array science activities including a fire experiment and deploying nanosatellites. It will complete its last experiment Wednesday monitoring its own destruction when it deorbits into Earth’s atmosphere. Aboard the space station, the three-member Expedition 48 crew practiced an emergency drill. In the unlikely event of an emergency such as a rapid depressurization, the crew would put on gas masks, head to its Soyuz spacecraft, put on their Sokol spacesuits and prepare for an undocking and descent back to Earth. More saliva samples were collected today for the Multi-Omics study researching how an astronaut’s immune system is affected by a long-term spaceflight. The crew also explored heart health in space and analyzed water samples for microbes.